(Newser) – The family of a Fort Lauderdale woman who has been in a coma since a Dec. 28 electric scooter crash says the accident happened because she was misled by the rental company and they plan to sue. Ashanti Jordan, a 27-year-old security guard at Broward Health Medical Center, suffered a fractured skull after colliding with a car while riding the Lime scooter, the Sun-Sentinel reports. 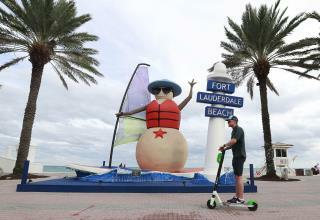 Attorney Todd Falzone says the Lime app and writing on the scooter itself warn against riding it on the sidewalk—but state law bans riding electric scooters on streets and they are only allowed on sidewalks in Fort Lauderdale. "Lime is telling these riders to break the law," he says. "They’re telling them don’t ride on the sidewalks and then, as a result, these poor folks are in the middle of traffic." She should’ve just used her common sense!!! I sure she knew she should just stick to the sidewalk!!! It’s just ridiculous to sue!!! She was just plain negligent!!! Sad situation, but I don't see how it is anyone's fault but hers. Usually things like this have people assume risk in the contract/rules. I think their legal argument is pretty thin. I'll bet they're being hag ridden by an attorney. I also question her being thrown 100 feet. How fast would she have had to be going?